This is the second part of our latest construction project. 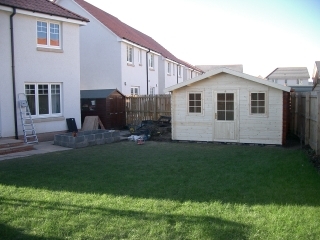 Here we have the Oban log cabin which we believe offers a high specification and yet is great value for money. 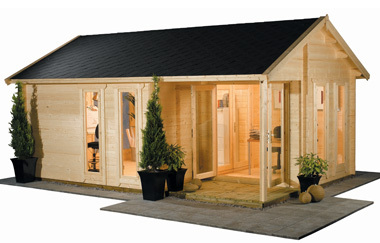 With thick 38mm walls and double glazing and a price tag of £1895 this log cabin is hard to beat. The roof is covered with 19mm tongue and groove. In the next post we'll look at some of the installation options we have added to this model. 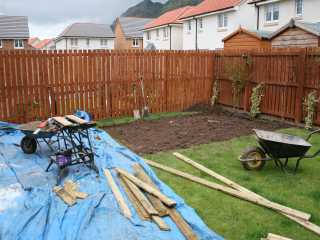 Probably the biggest challenge when faced with a log cabin construction project is the base. This can be even more challenging when access becomes an issue. The labour involved in moving over a ton of aggregate through someones living room certainly makes the task quite a bit tougher. An alternative is to lay concrete slabs evenly spaced across the base to obtain a level surface with considerably less concrete mix. In this case though greater care must be taken to ensure the ground is well compacted and not prone to movement which could affect the building as ground conditions vary. The log cabin itself varies in terms of construction though walls are generally made of single or double tongue and groove and each piece is lap jointed to the next wall. Construction is quite straightforward but this has to be weighed up with the time and cost of assembling the base. If you are a keen 'diy'er you may consider tackling the assembly yourself but it does require at least two days to complete, a selection of hand tools, and a head for heights when you start to fit the roof and roof tiles. At Cabin Living we are fully insured with AXA and have had years of experience in the construction industry and can manage your project from beginning to end. It just goes to show with googles desktop forecast as with just about any other forecast you have to take it with a pinch of salt. According to my desktop forecast it should be showery and about 17 degrees instead its 24 degrees in my shaded shed and probably warmer in the office due to its site in the sun! Admittedly my thermometer isn't any more than a souvenir from a ski-ing holiday but I know its a lot more than 17 degrees Celsius out there. A few days of sunshine can make you dream up all sorts of wonderful ideas. With energy bills on the rise we have been studying our electricity consumption fairly closely and with threats of high increases in the near future any ways of reducing utitlity bills start to look interesting. 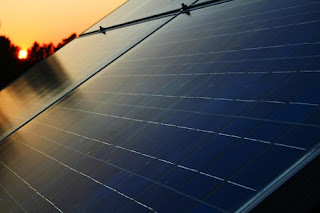 We've been looking at some of the photo cell solar panels out there and they are really starting to look like a good choice. Panels vary in cost but for about £150 you can get a fairly decent one that should power a laptop all day. Ofcourse thats not the end of it...you will need a power invertor and a spare car battery. I already happen to have the invertor which I use to power the laptop when we're on a long drive so the kids can watch dvd's! To be honest its not a big problem. 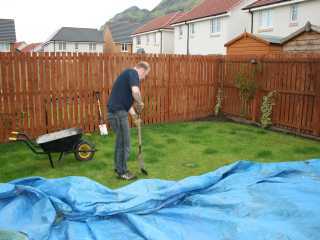 But the trouble is you look out the window and especially at this time of year you can literally watch the grass grow. Which got me thinking about lawn mowers. Remote control ones..of course there are examples out there that look very high tech but also look like they tickle the grass rather than cut it. So I introduce the kind of remote mower I'd like to have. One that works! 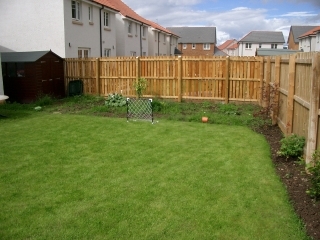 There is no doubt the corner of this garden needs something. I thought a Kota BBQ hut would be ideal here. But then I did some research and I saw the prices. Considering the amount of wood involved in one of these I can't quite figure out why they are so expensive. There's got to be less wood in them compared to at least half of our log cabin range and yet they cost a fortune. So I have new goal I'm off to to the trade shows this summer on a mission to find a better deal, so that Cabin Living can supply these in the UK at a price that doesn't leave your mouth wide open. Hopefully my herbs and veggies will appreciate this. Sometimes I can't fail to be amazed by how easy it is to find things on the net. I think I'm going to connect one of these up to my Log Cabin this weekend. Its not exactly complicated but someone has the time to spell it out even if I don't. With a summer like this one I'm not too sure how much I need it but at least it saves some precious tap water. You know I just googled "homeworking news" and virtually nothing seems to have been indexed since 2007. A slight exageration but only slightly. So why is homeworking out of the news? The answer is I don't know. 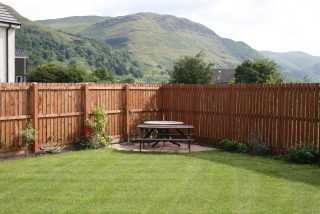 We live in Central Scotland on a fairly modern estate and I can pick out about five people a stones throw from here who work from home. A couple are in sales, one proof reads novels another is an accountant and another works in web design. This trend is definitely on the rise and who can blame them. 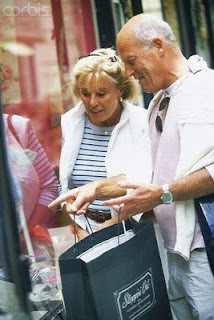 Cut down your travel costs, save time and have more time with your friends and family. It sounds great but the truth is with space a premium the home office is often a compromise. Setting up and clearing away on the dining room table if you have one isn't ideal. Ofcourse if the office is just behind the spare room door it may be hard to switch off...especially if the email's continue to ping in through the evening. So that is why I've fallen for a garden office. It's not exactly a long commute... 6 possibly 5 seconds on a good day. But its far enough away to switch off in the evening...and I don't get distracted by the children or the washing machine going on to full spin. So what is the news...I like it ....I dare say I love it...if you can make it work for you...I suggest you jump on in and try the water....Homeworking is the future. The following quote is taken from Dave over at shedworking one of our favourite blogs. "There was a huge public response to the competition with more than 3,000 votes for over 900 entries in 12 categories but in a very, very close call the winner is the Rugby Pub owned by Tim from Sudbury, Suffolk. Designed and built by Tim himself, it has eight roof lights, an octagonal roof and double doors. Plus a full bar, three fridges, ceiling fan, running water and sea grass matting floor. And a hammock. But there's no television, no phone and, as Tim puts it, no shortage of liquid refreshment"
The first reminds me of those expensive jewellery shops where if you need to ask how much it is you can't afford it! 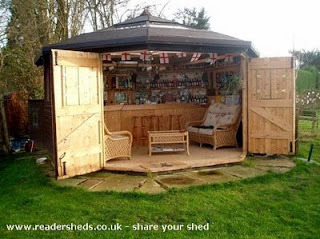 And if you're looking for a garden office you'll find plenty of sites like that. Now, how many people who want a garden office have the time and the energy to dig out their site, a mixer and a over a tonne of aggregrate and cement to do the toughest part of the installation? So here is the difference Garden Office Installation that is comprehensive, affordable and pricing that is there for all to see. I thought it was time to introduce the log cabin I have in my garden. The first one we had was built down south at our old house and I'm sure it was probably one of the top reasons we sold that house so quickly. Log Cabins certainly are a unique selling point. Anyway back to the here and now. This is a picture of the site. Sorry no step by step pictures of assembly instead now you dont see it then now you do! and now the now you do. I suppose one question I often get asked is do you need planning. Basically if it is 5 metres from your home..no, you don't. There are other rules such as less than 4m high with a pitched roof...not closer than the home to any highway...and uses ancillary to the main home (in other words don't move granny in there). That said if you had an extra friend over one night and if it was the choice between erecting a tent in the garden and sleeping in a cosy cabin I know which one I'd go for and I wouldn't expect the council to be breaking your door down in the morning. 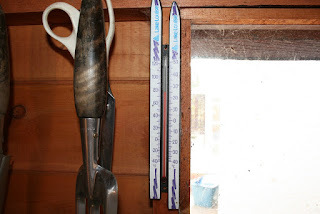 Over the next few posts I will add a bit more about how I use my log cabin. Periodically I will display projects we have recently worked on to give you further insight into the type of work we do during your cabin installation. First the base is marked out. It is always worth contacting your council to confirm there is no problem with your site. No problems here as the proposed site is more than 5m from the home. 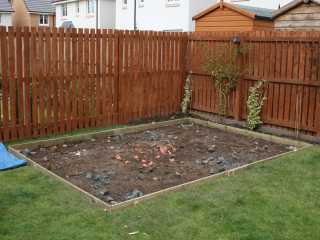 The turf layer dug out to a depth to accommodate the shuttering for the concrete base. The soil layer must be compact and level. The shuttering is put together and then staked around the edge and fixed to produce level and solid frame ready for pouring concrete. 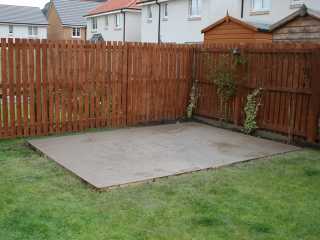 The concrete base is poured and levelled ready for delivery of the log cabin. This work is normally completed at least a week in advance of the expected delivery date. Installation part 2 will be added following cabin delivery and assembly. With fuel going through the roof and general working trends changing with technology the home office certainly has a future. I work from home at least some of the time and I am also a partner in Cabin Living which specialises in garden office installation. 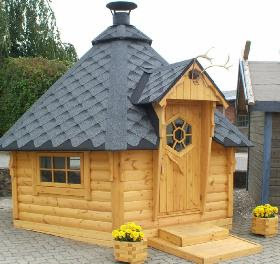 The company started when we were building another log cabin in our garden and thought there's not enough people offering this kind of service. To some extent that is still true. The competiton is huge but most companies claim to offer installation services without ever being open about prices. They hide them away and ask you to phone. Often if you delve into the small print they dont offer base installation which is probably the toughest part of the process in many respects. So pay us a visit and see for yourself no hidden prices we hope our site is informative and refreshingly clear for all those interested in working from home and escaping the rat race.